The Sylvan works ceased trading in 1982 and all the records relating to styles and dates of production etc, were destroyed. This hasn’t stopped avid collectors from gaining as much information as possible over recent years, and piece by piece the general picture has been put together. There are still models however that haven’t been recorded and these are avidly sought by collectors. If you have a colourway or a unique piece of SylvaC, it could be worth a small fortune. Pictured left Bunny Model No’s: 1026, 1065. The factory was founded in 1894 by William Shaw and William Copestake and given the company name of Shaw & Copestake. William Copestake however left the partnership half way through the first year and in 1895 Mr Richard Hull became William Shaw’s partner in the buisiness. Their partnership grew in strength and over the forty years of producing decorative wares (and what was known as ‘fancies’) Richard Hull was to have a major influence, including the development of the export side which was to lead the way for the Companie’s future success. Pictured left Mr Sylvac Ashtray Mode No: 3542. In 1935 Richard Hull Junior joined the company as the new partner, when Richard Hull Senior passed away. With the input of Richard Hull Junior and William Shaw the business continued strongly. 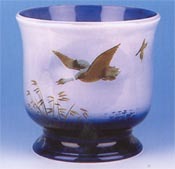 Pictured right Two Falcon Ware Posy Vases Model No’s: 1984, 1965. 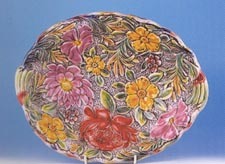 In 1938 the Thomas Lawrence Falcon Pottery was acquired, due to a connection between the daughter and her marriage to Richard Hull. These two factories operated independantly of each other for nineteen years until a suitable factory was built on land opposite the old Shaw and Copstake Factory. 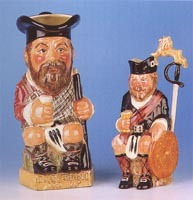 Pictured left “Hamish”, John Grant Promotional Toby Jugs. These new premises brought the gradual merger of the two businesses and by 1964 the Falcon Mark was ceased. Following the voluntary liquidation of Shaw and Copestake in 1982 the premises and equipment were purchased by the North Midlands Co-Operative Spociety and from there leased to a workers co-operative society known as Longton Ceramics. Pictured right Misty Morn Jardiniere Model No: 199. Eighteen months later the united co-operative society took over and ran it under the Crown Windsor name. This was not to be a successful venture and they only managed five months of production before liquidation. The premises are now onwed by Portmeirion Potteries Ltd who in 1991 began to operate from there. Every piece of SylvaC stock was sold off, and among them even some of the displ ay pieces which command high prices today. Pictured left Falcon Ware Bowl incised decoration. SylvaC has become synonymous with animals, especially dogs and most famously rabbits. The rabbits first appeared in the early 1930s and came to be produced because while in France, Mr Richard Hull had come across a similar model and knew immediately that they could be commercially sound. 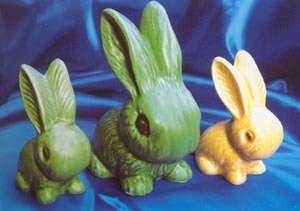 The rabbits were produced for over 40 years until 1975, and in many colours and glazes, the most common being green. 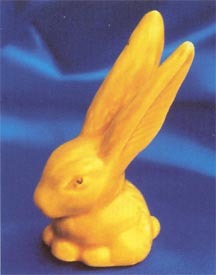 The glazes on the rabbits were matt until they it was discontinued, when a gloss finish appeared in thr 1970s. The shapes included crouching rabbits, one ear up and down rabbits, Harry the Hare, and comical rabbits. Over two hundred dog figures were produced and nearly every breed was represented in one form or another. Prior to the Second World War when business was buoyant and competition fierce, Shaw and Copestake had produced approximately forty models. Mr Richard Hull who had connections in France, installed a French modeller intiailly to design the figures. Pictured left “Toby” Toothache Dog Model No: 3183. The terriers proved to be the most sought after and continued to be saleable throughout all the business years. 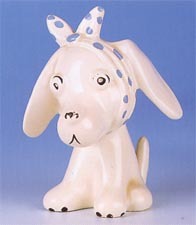 One of the most popular of the novelty dogs is known as the “Toothache” Dog modelled by Reginald Thompson. One of the most elusive of all is what is known as ‘Mac’ Dogs. Produced in five sizes by Otakar Steinburger who was a London based modeller from Czechoslovakia. This model was in the form of a Scottie Dog holding a golf ball. Pictured right Scottie Model No: 147. 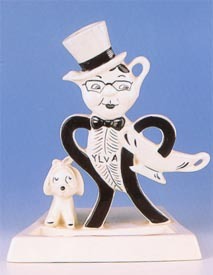 Other than animals, SylvaC Pottery included Gnomes, small novelties called ‘Fancies’, Character and Toby Jugs, figures, advertising wares amd tablewares.